Dearness allowance is an allowance that was introduced by the government as one of the factor for employee wage revision, later, this dearness allowance was linked to the consumer price index and the allowance is revised by the government from time to time depending in inflation and various other factors applicable to the economy, where this dearness allowance is calculated on percentage basis on Basic salary + NPA + Stagnation Increment. The new dearness allowance of an employee becomes even more significant in an unorganized economy such as India which is fragmented into various parts such as villages, towns, cities and metros, and the component of the salary takes into account the difference in the cost of living in these different parts of the country for the employee, and the IDA or CDA is a taxable income which does not allow any type of exemption for income tax. In case of the government employees, it becomes even more significant because they have to relocate across the country depending on the need, and thus, the cost of living would vary which is further depending on the inflation prevailing in the place of residence, and this factor would help to adjust the salary and neutralize the fluctuations between different regions with in the country. Dearness Allowance is linked to the basic salary of the employee and is a certain percentage of the employee’s salary, and thus an employee staying in the rural area would have a different dearness allowance compared to an employee living in a metro. Dearness Allowance is further divided into two parts as Industrial DA and Central DA, so let’s have a look at the detailed information on both the rates about the calculation and up to date increase and decrease of IDA and CDA rates. The allowance named as Industrial Dearness Allowance is given to the public sector undertaking employees including the pensioners to compensate the inflation prices on various items, where IDA rates which is given to PSU working and retired employees and is generally not given for the private sector employees which means that the private sector companies are not forced to provide dearness allowance as a component of the salary to their employees. IDA is scrutinized frequently to keep it related to the inflationary pressures applying in the country and generally this frequency for changing in IDA rates is kept as QUARTER (1st January, 1st April, 1st July and 1st December of every year), where the frequent changes in the inflation in the country is the main reason for change in the industrial dearness allowance implying in a country, and IDA rates for PSU employees of working and retired is generally modified quarterly by taking the average of the previous 3 months of All India Consumer Price Index (AICPI). New IDA rates = (Average of AICPI for previous 3 months – Base Index) * 100/Base Index. The specially designed allowance for central government employees is Central Dearness Allowance, and thus all the employees and pensioners who are working under central government would have slight different pay scale structure and calculations for calculating CDA rates, and with effect from 01.04.2004, Central Dearness Allowance equal to 50% of the basic pay is treated as Dearness Pay, which will counted for the purpose of payment of allowance, transfer grant, retirement benefits, and contribution of GPF, Licence Fee, Monthly subscription to CGHS and various allowances, where the dearness pay will not count for LTC, TA/DA while on transfer and Government accommodation. Industrial dearness allowance (IDA) is calculated quarterly based on the basis of AICPIN for the previous 3 months whereas the CDA rates is calculated twice a year. The base index kept for calculating the dearness allowance rates in IDA for PSU and CDA is different. IDA rates is applicable to the public sector employees while the CDA is applicable to the central government employees. IDA and CDA rates are different for the employees and the pensioners and is applicable in India as well as the neighboring countries such as Pakistan and Bangladesh. For the calculation of CDA, Base index used is 115.76. While calculating dearness allowance regarding to CDA / IDA rates, the fraction of 50 paise and more are rounded off to the next higher rupee, where as the less than 50 paise ignored. Industrial Dearness allowance or CDA Rates has helped the employees in revision of salary and offsetting the impact of inflation and regional differences and thus bringing more job satisfaction to the employees on increasing the employee wages for the specified months in the form of IDA rates for PSU employees and CDA rates for Central Government employees / pensioners. BSNL Salary slip is a documentary proof issued by the employer to BSNL employee having detailed description about the pay or employee’s salary of that current month raised from ERP BSNL eportal by showing all the salary components of income paid and deductions of the employees towards loans, Employee provident fund or GPF along by showing income tax details of the current financial year. Let’s have a look at all the details on downloading BSNL salary slip for the current month. 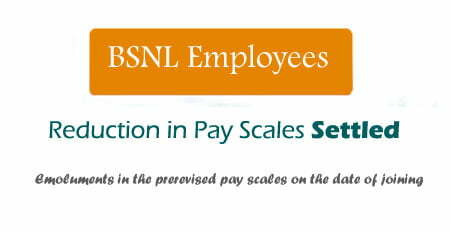 Basic Salary : It is the most important factor of salary fixed on BSNL pay scale for employee to calculate all the allowances of the total salary which shown in the BSNL pay slip. Dearness Allowance (DA) : The applicable DA for employees is Industrial Dearness Allowance, and the BSNL IDA rates of the employee calculates as per the Central Price Index numbers and paid with increased rates to employee to reduce the impact of inflation. House Rent Allowance : HRA is one type of allowance paid to BSNL employee on the basis of Basic Pay as per the categorization of the working location to compensate the rented house payment. Medical Allowance : An amount to cover the medical expenses of employee and his dependents on submission of medical bills through ESS ERP BSNL while in working in organization. Conveyance Allowance : Provides to cover the cost of travel from employee home to office and vice versa. Other Allowances : In this section, there are many other like Family Planning, Bad Climate allowance, Special Compensatory, Training allowance, Special duty, Washing allowance, Costof News Paper, Cash handling, etc paid by employer in the mode of encouragement to their BSNL employees. This part covers with mainly four parts, but the count increases as per the employee profile. Provident Fund: It is a compulsory contribution for each BSNL employee named as General Provident Fund or Employees Provident Fund as per the their recruitment. TDS : It is nothing but Tax Deductible at Source, which is deducted by BSNL on view of Income Tax towards the Pay as per the tax slab of the employee. Professional Tax : The amount of tax deducted towards the income tax payable, but applicable only in few states of India. Loans : It contains various Bank personal loan, Society Loan disbursed with the approval of BSNL disbursing officer. Court : Deductions towards the employee sureties or divorced suit against employee of BSNL. This part contains the complete income tax details of the employee as per section wise for the current financial year and which was already deducted, which of the amount to be deducted. The Salary slip of BSNL employee is the source to prepare Form 16 of income tax returns determining the tax to be paid and which amount is paid in advance or how much amount to be claimed towards income tax refund of the employee. BSNL Salary slip is the only one legal documentary proof for an employee to show their income for availing home loan, personal loan, and Credit cards. BSNL employee salary slip is the legal documentary evidence to submit while applying for VISA. After launching of SAP netweaver portal login, BSNL employees can have a chance to submit all the outdoor medical claims in online for early processing of reimbursement of medical expenses incurred for hospitalization without physical medical forms. For those BSNL employees and their dependents who added in BSNL ERP ESS login can directly submits their reimbursement claims and there is no requirement of old medical reimbursement form to claim the expenses incurred for hospitalization. 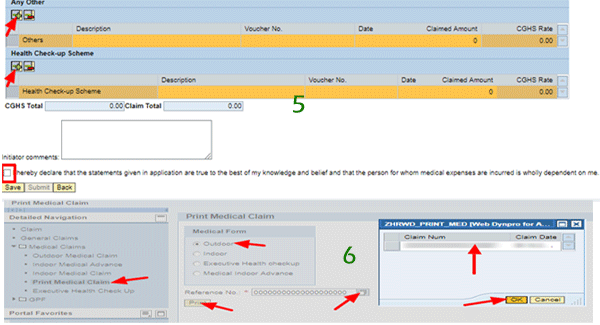 All the BSNL medical reimbursement claims will be processed as per the employee pay details only, if the claim exceeds the eligible amount, then the BSNL ERP portal doesn’t allow the claim in ESS login only, Let’s check the claiming process for new or rejected medical claims through BSNL ERP Portal at eportal.erp.bsnl.co.in. A new Annexure C will open for your to enter all the details by showing the eligible amount to claim in this financial year (in yellow color) by showing the employee salary details. Printed BSNL Medical Reimbursement Claim Bill (Annexure C) with signature of the employee. Doctor’s OP and Bill Receipt. Hospital Reports (Scanning / Tests) and bill paid receipt. Medicines Bill (If Purchased) having GST number and authorized stamp. All the above are mandatory to claim the reimbursement of medical expenses in outdoor pattern as per the eligibility of BSNL employee pay details, and apart from the above, if any reports available against the claim voucher amount shown in Annexure C of ESS ERP BSNL portal can also required to submit the photostat copies to avoid the rejection. In some situation employee BSNL reimbursement claims were rejected due to various reasons, In that situation, there is no requirement of submitting all the Mediclaim details again in BSNL ERP portal, just check the below process and submit your medical claim easily again in self service portal. Go to Printing process and submit the old rejected claim with new date by submitting the required documents. 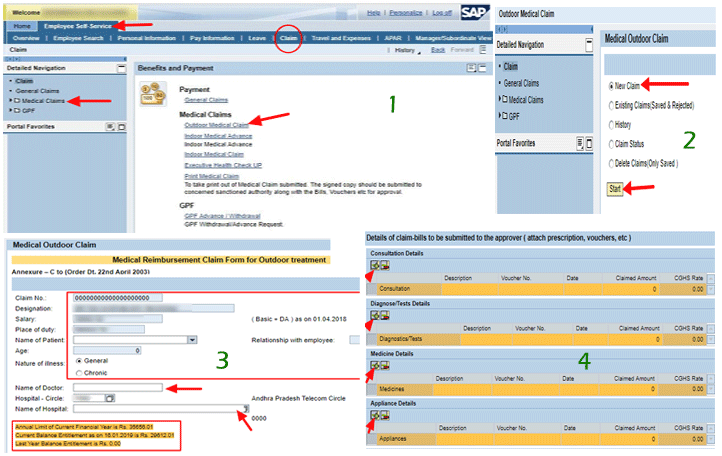 Any kind of BSNL medical reimbursement in manual or through BSNL ESS (employee self service) portal does not cover domiciliary hospitalization and not having any option to enter the same voucher details in BSNL ERP SAP netweaver portal login. Settlement of issue related to reduction in pay in the revised pay scale in respect of BSNL employees of Non executive cadre (other than Junior Engineer erst while TTA) appointed between 01.01.2007 and 07.05.2010 enabled in BSNL ERP ESS portal as compared to their pay in the pre revised pay scales. Attention is invited to the provision contained in para 2.2 of this office order No.1-16/2010-PAT(BSNL) dated 07.05.2010 wherein it was stated that Non Executives employees of BSNL who have joined on or after 1.1.2007 will be placed in the initial stage of the revised pay scales of BSNL ERP in which they are appointed. In cases where emoluments in the pre revised pay scale(s) on the date of joining BSNL [i.e. Basic Pay + DP/DA applicable on the date of joining] exceeds the sum of pay fixed in the revised pay scale and applicable IDA thereon on the same date, the difference will be allowed as Personal pay and it will be absorbed in future increments. The matter has been reviewed and the competent authority of BSNL has decided to dispense with the methodology of pay fixation as referred to above and now, the pay of Non executives (other than Junior Engineer erst while TTA’s) who have already been extended the benefit of one advance increment) appointed on or after 01.01.2007 and up to 07.05.2010 may be fixed at the minimum of their respective revised BSNL pay scale plus the difference amount which was allowed as Personal pay (emoluments in the pre-revised pay scale(s) on the date of joining BSNL [i.e. Basic Pay + DP/DA applicable on the date of joining] exceeding the sum of pay fixed in the revised pay scale and applicable BSNL IDA thereon on the same date) not to be absorbed in future BSNL increment on the date of appointment, so as to minimize the loss of pay on the date of implementation of new pay scales and the affected BSNL Non executives may be paid the due arrears. However, while implementation, it may be ensured that the refixation does not lead to any additional financial burden other than mere restoration of benefit under pre revised pay scales. So, with this news, BSNL employees who were appointed in the non executive cadre between 01.01.2007and 07.05.2010 will get some arrears in the salary of BSNL ERP ESS portal if they are eligible as per the above conditions.